Well here's a lovely Christmassy surprise. Strife—the Doom-era game that mixed first-person shooting with first-person roleplaying waaay before Deus Ex—is now on Steam, in remastered, 'Veteran Edition' form. 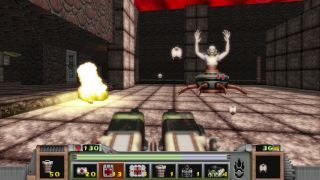 Despite the name, they haven't tinkered with the game to make it more palatable to war veterans, but they have (optionally) smoothed over many of its jagged pixels, restored a cut multiplayer mode, and generally ensured that Strife should be more compatible with today's mega-monitors, and with the youth of today's pixel-phobic retinas. It's also 25% off until next Friday. A persistent complaint I've noticed across Steam reviews and on the game's Steam forum is talk of sluggish mouse controls, but the developers are aware of this issue and say that they've fixed it in the beta build, so maybe give that a download if you find yourself suffering from that particular problem. Tech talk aside, why should you be interested in Strife? I'll let Paul Dean's Reinstall and Richard Cobbett's Crapshoot do the talking. If you'd rather buy it DRM-free, it will be coming to GOG in a few weeks.